As part of his first foreign trip as President of the United States, Donald Trump visited the Western Wall in Jerusalem Monday afternoon. He is the first sitting president to do so and also the first to make Israel a part of his first trip overseas. “It’s just been an honor to be here. 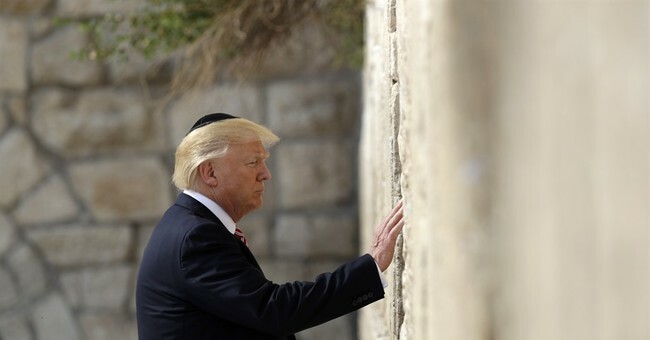 The Western Wall, was just incredible being there," President Trump said along side Israeli Prime Minister Benjamin Netanyahu at the King David Hotel. "As you know I’ve been a big supporter of Israel for a long time, I’ve been a big supporter of yours [Netanyahu]." "It’s just a magnificent place, magnificent people, many friends, my great friends come from Israel. It’s a great honor to be here," he continued. You can view some of the photos from the scene below. VIDEO: President Donald #Trump became the first sitting U.S. president to visit the Western Wall in #Israel.